This panel belonged to the Edward Solly collection in Berlin and later, between 1821 and 1928, to the Kaiser-Friedrich Museum in Berlin. During the time that it was in that museum the panel acquired a wax stamp on the back and an old inventory number. It was also recorded in various publications at this date whose aim was to disseminate the works on display to the public or in storage in the royal museums in Berlin. Thus Cenni di Francesco’s panel appeared in various works of this type from 1830 to 1927 before it was acquired for the Rohoncz collection. 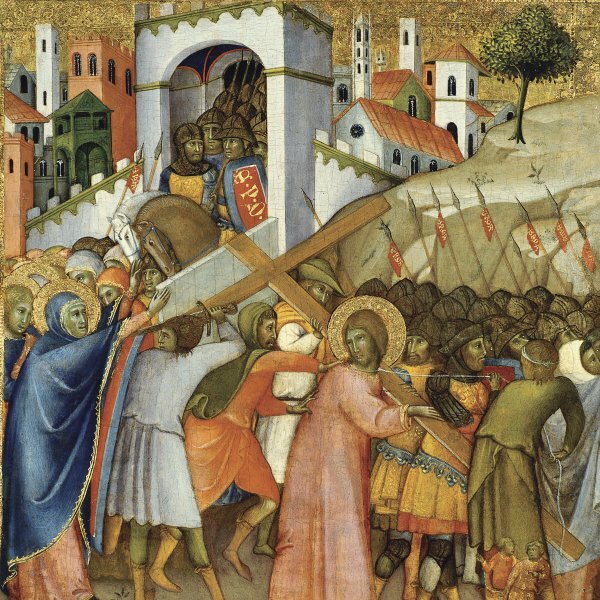 The year after its acquisition it was included in the major exhibition in Munich in 1930 as a work by Jacopo di Cione (1320/1330-after 1398). Nonetheless, in the 1937 catalogue of the Rohoncz collection by Rudolf Heinemann it appeared with the present attribution to Cenni di Francesco. Other authors, however, made different suggestions, including Luca di Tommè (active between 1356 and 1389), Giovanni del Biondo (active between 1356 and 1399) and the Master of Santa Catalina of the Kahn Collection. In 1936 Federico Zeri confirmed Heinemann’s proposal, attributing it to Cenni. According to Richard Offner, the subject of the painting is The Pentecost, which is an uncommon theme in Florentine painting. God the Father is depicted inside a mystic mandorla made up of blue cherubim and red seraphim, who together constitute the first level in the hierarchy of perpetually adoring angels. The divine sphere is completed with two groups of musical angels on either side of the mandorla, and the dove of the Holy Spirit above Mary’s head. 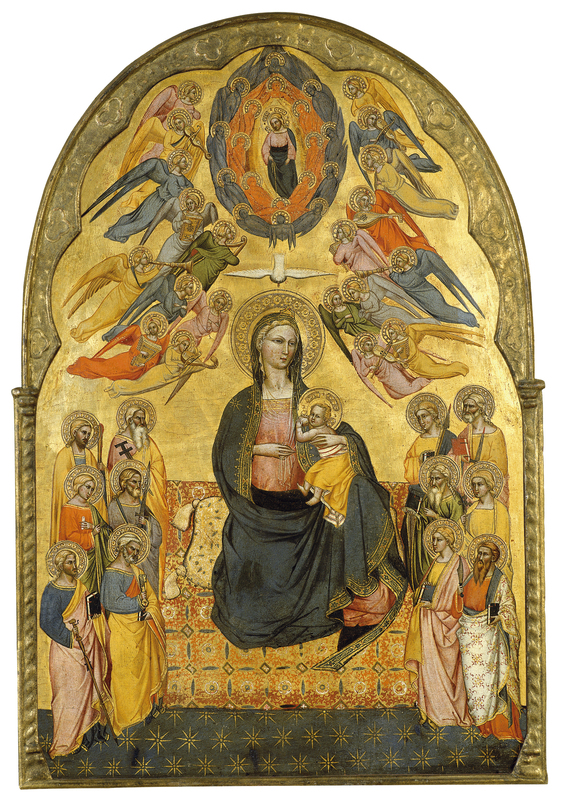 In the earthly realm we see Mary breastfeeding the Infant Christ, seated on a cushion on the ground, a type of representation known as “The Virgin of Humility”. On each side are the twelve Apostles, recognisable by their attributes. Boskovits identified the ones on the left, from top to bottom, as Matthias, James the Less, Simon, Thaddeus, James the Greater and Peter; and on the right, Thomas, Matthew, Andrew, Philip, John the Evangelist and Bartholomew. Cenni di Francesco organised a composition set against a gold background in which the figures are arranged following a rigid and rigorous symmetry. However, despite the hierarchy prevailing between the figures, they are depicted with slim, elegant bodies to which the effect of the carefully and elegantly painted folds of their tunics undoubtedly contributes. The reverse of the panel and the composition suggest that the panel originally had a triangular format, which was subsequently modified at an unknown date by the alteration of the panel at the top.